Preheat the oven to 350°. Butter and flour a 9 inch springform pan and line the bottom with parchment paper. In the bowl of a stand mixer, combine the sugar, flours, baking powder, salt and coriander. Fit the mixer with the paddle attachment and with the mixer on low, add the butter. Add eggs, one at a time until completely combined, and mixture is creamy. With the mixer on low, slowly add the cream until smooth. Finally, quickly mix in the apple cider vinegar and vanilla. Transfer the batter to the prepared pan and smooth the top. Bake for 1 hour or until a toothpick inserted in the center comes out with just a few moist crumbs. The cake will be very dark. Let cool completely before removing from the pan. In a small saucepan combine all ingredients except brandy. Bring to a simmer and let cook for 5 minutes. Remove from heat and add brandy. Let cool completely and store in the refrigerator. Strain before use. In a medium saucepan, melt butter and 4 Tbsp. coriander seeds and let cook over medium heat until butter is lightly browned and fragrant, about 10 minutes. Let cool for 10 minutes and then strain out the coriander seeds. Discard seeds and let butter cool completely. Refrigerate until cold. Using an electric mixer, beat the cold brown butter until smooth. Add the cream cheese and beat until combined. Add the powdered sugar and slowly beat until completely smooth. Add the cream and vanilla and beat again until incorporated. Preheat the oven to 350 degrees. Line a baking sheet with parchment paper. Place the raspberries on the baking sheet and sprinkle the sugar over top. Bake for 30 to 45 minutes, stirring every 15 minutes. The raspberries should cook down into a jam-like paste. Cool completely. Cut the cake into two layers with a long bread knife. Using a pastry brush, brush a generous amount of the milk soak onto both cut sides of the cake layers. Let soak in for a few minutes. Spread a layer of the buttercream over the bottom cake layer, and using a pastry bag pipe a band of frosting around the edges of the cake in a ring. This is to hold the raspberry filling in. 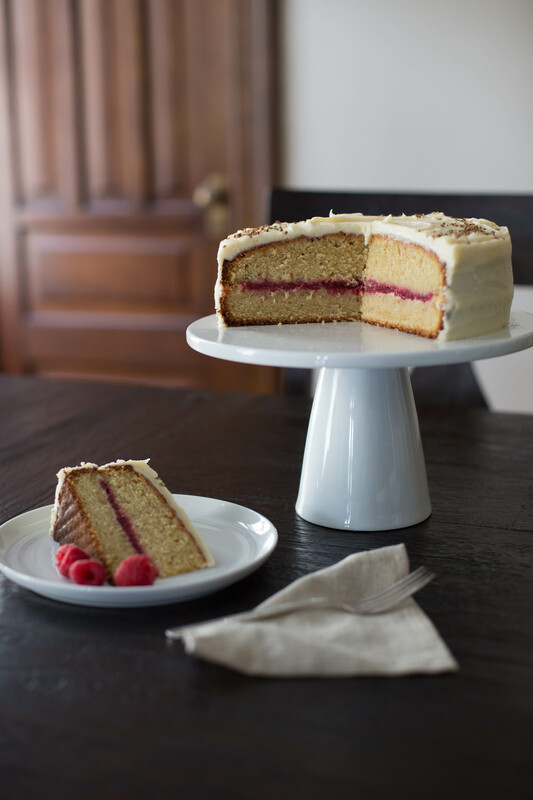 Spread the roasted raspberry filling onto the middle of the cake to create an even layer. Place the other cake layer on top. Brush some more of the milk soak onto the top of the cake and let soak in for a few minutes. Spread a thin layer of buttercream over the entire cake as a crumb coat. Refrigerate the cake for 30 minutes to 1 hour, or until the crumb coat is firm. Finish icing the cake with the remaining buttercream. Heat a dry skillet over medium heat and add the coriander seeds, swirling the pan until seeds are fragrant and toasted, about 1 minute. Remove from heat and let cool completely. Lightly crush with the side of a knife on a cutting board or pulse once or twice in a spice grinder. Garnish the top of the cake with the coriander. Serve the cake with fresh raspberries on the side.